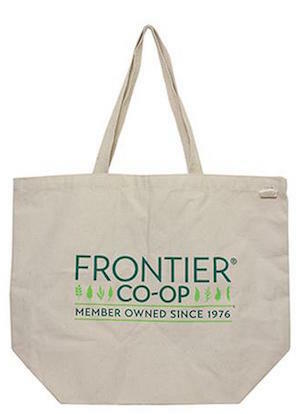 Tote Bag 19" x 15-1/2"
Made by EcoBags for Frontier, our Canvas Tote is the quintessential reusable farmer's market bag. Unlike bulkier totes, this bag folds neatly and easily to fit in a small space and has been double stitched for durability. This 100% cotton, fairly-traded bag is eco-friendly, stylish and versatile. So, go natural and choose canvas - because plastic bags are so yesterday. Machine washable cold, hang dry to keep from shrinking.